Groupama Stadium, also known as Parc Olympique Lyonnais, Parc OL, or Grand Stade OL, is the recently opened new home of Olympique Lyonnais. It replaced Stade de Gerland as Lyon’s home ground. 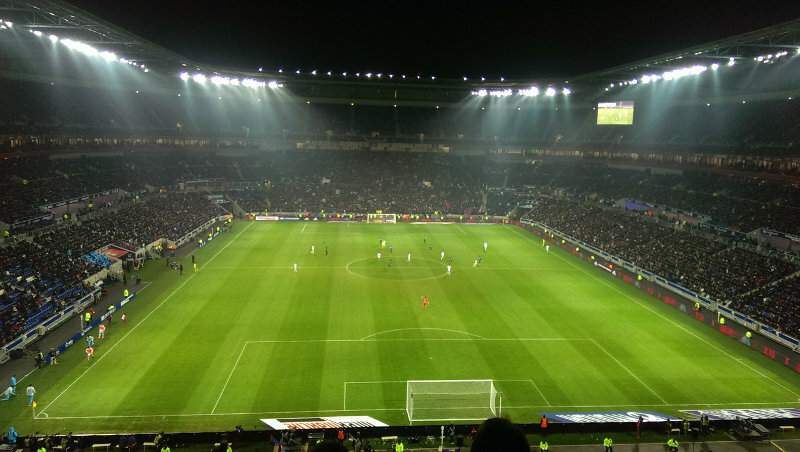 Lyon had been looking to build a new stadium from as early as 2007, but saw earlier proposals delayed due to local opposition and a lack of funding because of the financial crisis. The project received the final push when France got awarded the Euro 2016 tournament and Lyon got selected as a host city. Lyon received their building permit in February 2012, and later that year building works kicked off. Delays however postponed the expected completion date from the summer of 2014 to January 2016. 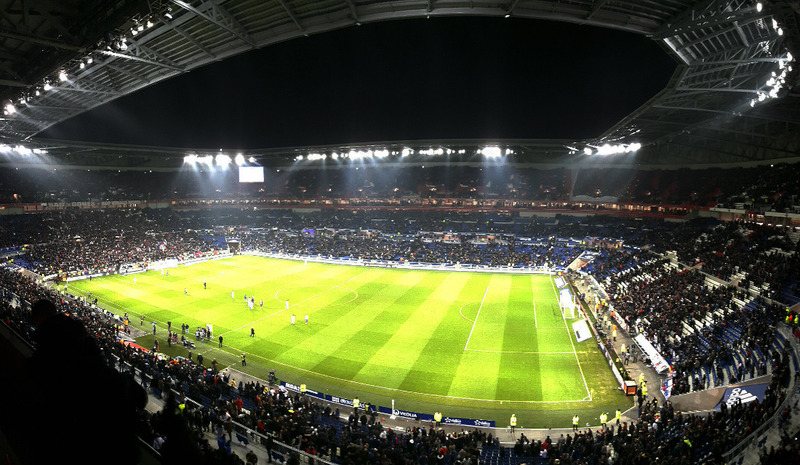 Parc Olympique Lyonnais officially opened on 9 January 2016 with a league match between Lyon and Troyes (4-1). The stadium has a capacity of 59,186 seats, of which about 6,000 business seats and 105 lodges. It came at a cost of roughly €600 million, including almost €190 million for improvements in infrastructure. During Euro 2016, Parc Olympique Lyonnais hosted four group matches, the round of 16 match between France and Rep. of Ireland (2-1), and the semi-final between Portugal and Wales (2-0). In 2017, the stadium was renamed Groupama Stadium following a 3-year naming rights deal with insurance firm Groupama. Groupama Stadium has been selected to host the 2018 Europa League final. Groupama Stadium is located in the Lyon suburb Décines, in the east of the city and just over 10 kilometres from Lyon’s city centre. The stadium, located right next to the N346 / E15 motorway, is easily reached by car. Get on the N346 from the A42 in the north or the A43 in the south and take exit 6. If using public transport, the stadium can be reached by tram. The stadium is only a 10-minute walk from station Decines Grand Large of tram line 3, which runs just north of the stadium, but on matchdays a special branch will bring you right in front of the stadium. Line 3 departs from Gare Part-Dieu on the eastern edge of Lyon’s city centre. Parc Olympique Lyonnais is located on the edge of the city in a quiet suburb, surrounded by residential housing and farmlands. There is little around in terms of eating and drinking apart from the odd fast-food restaurant, which therefore best done in Lyon’s pleasant city centre. Most will also decide to find a hotel in the centre of Lyon, though if you want to stay close to the stadium, then there are a few roadside hotels around. These will likely most appeal to those arriving by car. Hotel Grand Est and B&B Hotel Lyon Meyzieu are decent mid-range options located right on the other side of the N346. Click here for an overview of hotels near Parc Olympique Lyonnais. Of course, most will decide to stay in Lyon’s city centre, which boasts plenty of options in all price ranges. Tickets for Lyon matches can be bought online through the official website through official ticket partner viagogo, in person at the club store at the stadium, or at the OL store at the 104 Rue du President Edouard Herriot in Lyon’s city centre. Ticket prices depend on the opponent, but expect to pay between €30.00 and €65.00 for an upper tier seat and between €60.00 and €275.00 for a lower tier seat. Lyon offer guided stadium tours around Groupama Stadium that include the players’ tunnel, dugouts, press room, and hospitality areas. The tours lasts 75 minutes. The club offer a shorter ‘mini’ 45-minute alternative as well with less access. Tours run 5-10 days a month multiple times a day. Check online for the current schedule and bookings. The regular tour costs €19.00 while the mini tour costs €9.00. Unless you’re arriving directly by SNCF (even then really! ), the best strategy is by no means the Parc OL shuttle from the Part-Dieu Station (which actually boards about 250m down the avenue). Option 1 take the métro to Vaulx-en-Velin La Soie. There you get a similar Parc OL special to the same esplanade but it’s a lot less walking and crowds for boarding both before and after the match are much smaller. This solution is best if you’re staying close to métro lines A or B and/or have tickets in the north end of the stadium. Or take metro line D to Grange Blanche, change to tram T5 to Eurexpo, from where there are free shuttle buses to the stadium – these leave every 20 or 30 SECONDS so loading is quick, and arrival point is more convenient for the south end. Attended this new stadium, for the first of my five games at Euro 2016. Went to Stade Gerland in 1998 to watch Rovers in the UEFA cup. The new stadium is fantastic, bit of a palaver in the food queue as I was in the paying by card queue and it wasn’t so clearly marked. Fantastic views from my seat. Got on what I thought was a free shuttle service before the game but was actually the commute home and myself and thousands of Belgium fans had not paid! On the way home it was an hour until I got on a tram and many thousands more were still waiting, and it was tipping it down. Great day though. Went to see this beauty in March. Very nice inside, but it was not finished outside at that time. Bought my ticket(against Guingamp) before the game for 27,5 Euros. Ticket office is located inside the club shop on the first floor. In order to get to the stadium you have to go through the club shop anyway-clever aren’t they? The stadium is massive and allow some time to get there, as security measures slow things down. There is a special tram that leaves from about 300 meters away from central station to the stadium. Journey takes about 30 minutes. The queue after the game was horrific. I spend over an hour to get into one of the trams. Overall very nice stadium with nice support. Having planned to attend Marseille game the same day I was expecting better atmosphere in Marseille. I was wrong. Lyon fans were really loud. Recommend! The Stadium is fantastic with clear views all round and plenty of legroom around the seats, however the toilets are a real slow and badly planned experience. I left my seat at half time and missed 5 minutes of the second half whilst waiting?